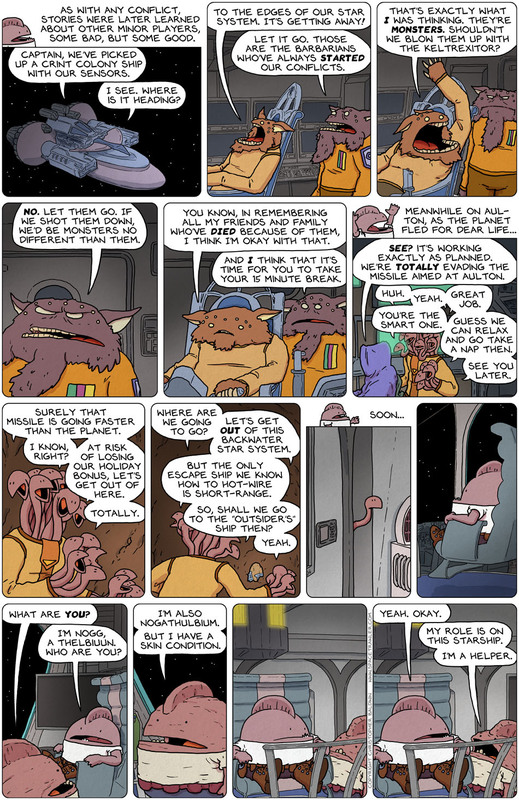 So, right now there are a handful of strips left to THE FIRST PART this new iteration of Spacetrawler. Like the first run, I’m splitting it up (probably) into 3 parts, so we’re maybe almost a third through? I have the end of the first part all written, but things always shift and change, but I’m guessing it will end mid-October, and immediately begins PART TWO. And I am the FIRST to agree with those a little confused as to who is who, the dragnet unintentionally got a little wide with this storyline. But the ending of part one should rein it in a bit. I’m suddenly reminded of when Joyce and King were discussing how the only reason Nogg meets with any success at all is because he surrounds himself with people that are smarter and more competent than he is. Who wants to bet that the next strip is going to involve him getting clubbed over the head and/or stunned? He can’t really be THIS stupid. Yes. Yes he can. He certainly can. I’m sure Nogg, a Thelbiuun, isn’t too stupid to notice that the Nogathelbium doesn’t belong there, and just plans to watch what it does. Apparently the snakes watch too many TV shows were you can pretend to work at a place you plan to rob and no one questions it. Chris, apparently your website is blocking my email. It’s not sending me new strips and followup comments, and you’re not getting my emails about the problem. Hi! Sorry, haven’t responded, Coyoty. I have received your emails and have been trying to fix it! Actually, in terms of my plotting reputation, not as ominous as one might think. As in, “ending this rein of terror”? or as in “reining cats and dogs”? I guess Nogg just demonstrated he his utterly out of fucks to give. Or he is just completely out of range on how oblivious he can be. Either way, I love it. The man (fish?) has watched his crew completely outmaneuver him in all matters, rendering him pretty much superfluous, and his main goal of forging a peace deal just blew up in his face, so he’s probably feeling pretty unmotivated to care about anything right now. What do bags of snakes really WANT? Nogathelbium and the other snakes are quickly becoming some of my favorite characters, and that’s saying something with this chapter’s diverse and fun mix. Nogg is clearly planing to leave the fake Nogg holding the bag.